I just read this article and thought you might want to give it a read, too. 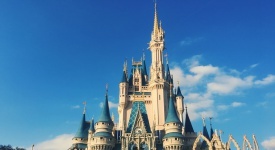 It\'s called 13 epic Orlando day trips less than 2 hours away and you can find it here https://www.orbitz.com/blog/2018/04/orlando-day-trips/. 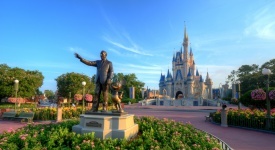 When most people think of Orlando and Central Florida, they think of one thing: theme parks! 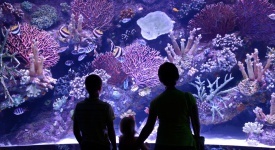 While the area is home to some of the best theme parks in the world, there is so much more to do than most people realize. This list of epic day trips less than two hours from the city will definitely make you want to extend your visit. RELATED: Quiz: Which Orlando theme park is for you? 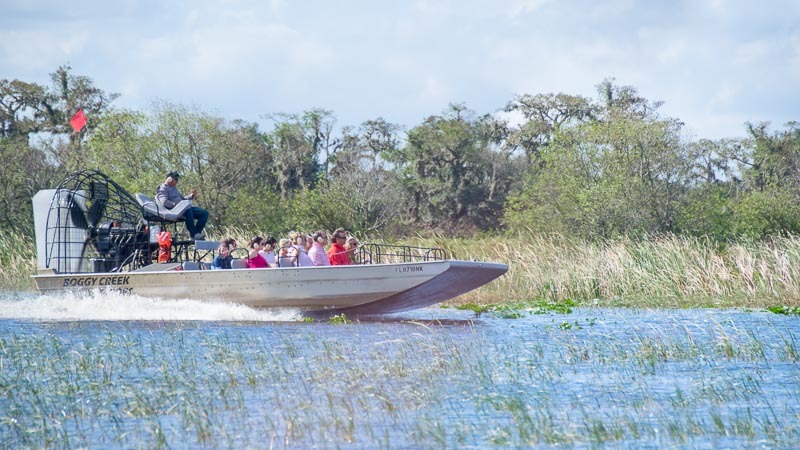 How about a hair-raising ride on a fan boat looking for Florida alligators? Head to Kissimmee and grab a seat on a custom built boat made for the swamps with a propeller so big it could almost power a small airplane. A guided tour of the swamp is a great way to spend a morning or afternoon of your vacation. 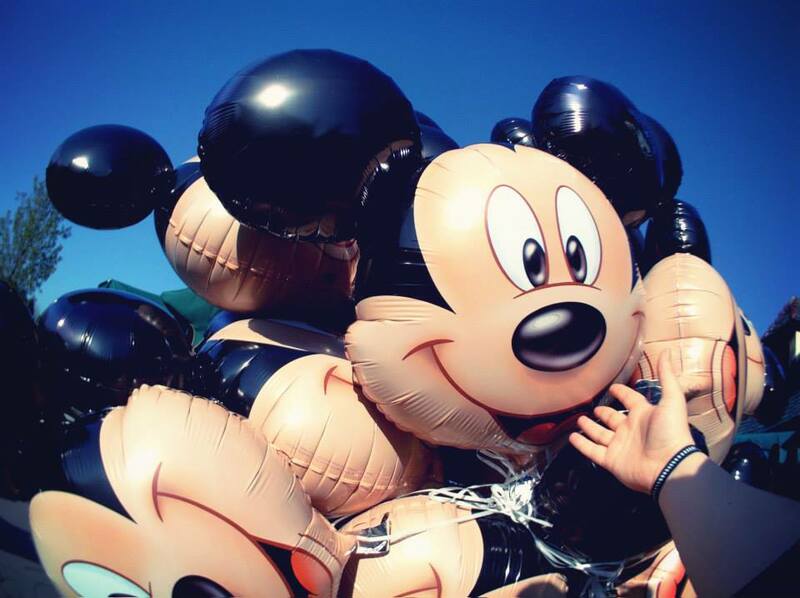 One of the coolest things you can do near Disney World is taking a hot air balloon ride. 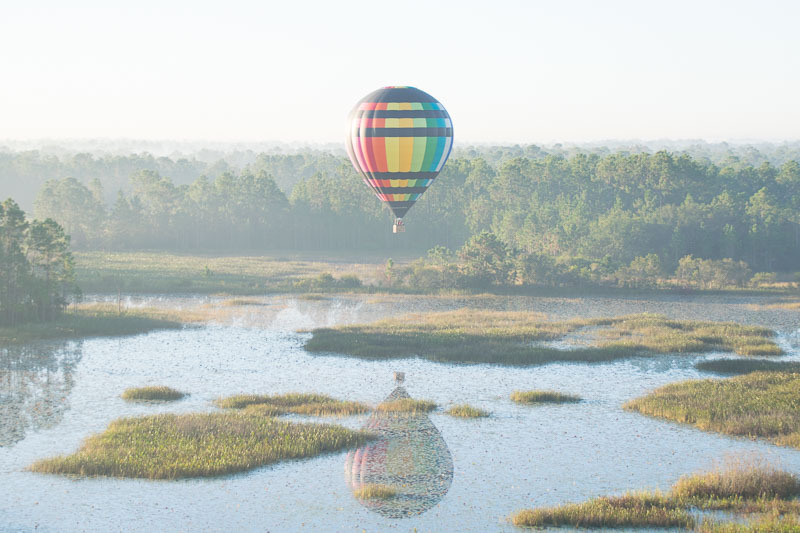 Lift off with Orlando Balloons in Davenport and watch the sun rising over Central Florida. If you’re lucky and the winds are right, you’ll get a one of a kind view of the area’s theme parks. 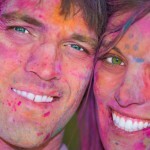 A must do if you are looking for something unforgettable to add on to your next Orlando trip. 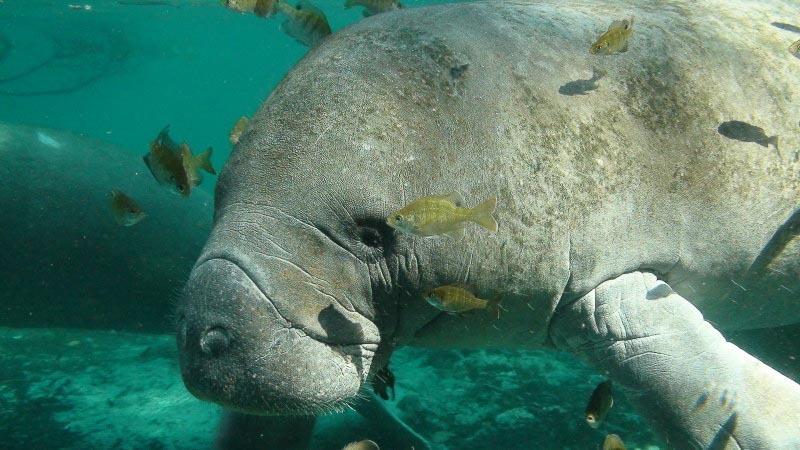 Jump into the pristine waters around Crystal River to have a swim with some adorable manatees. The area around Crystal River is one of the few places in the country where you can legally swim with these so called “sea cows,” and it’s just a short drive away from Orlando. Plan your trip accordingly, the manatees only hang around from November to March. 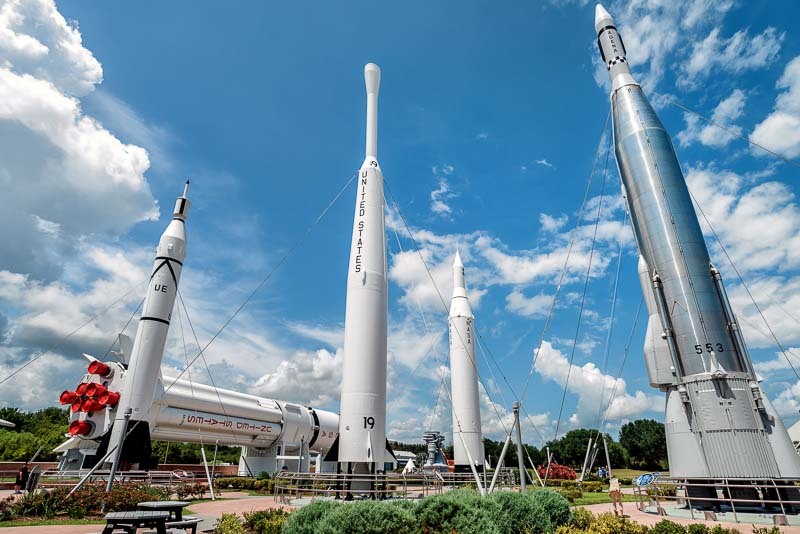 For wannabe astronauts of all ages, make sure to take the less than one hour trip from Orlando to the Kennedy Space Center at Cape Canaveral. The center has one of the largest collections of rockets and space equipment on the planet and you can even have lunch with a real astronaut. For some education along with entertainment, this is a must. Warm and sunny Central Florida is the perfect place to play a few rounds of golf. The area around Orlando has 15 courses, including top spots like Reunion Resort, Waldorf Astoria Club and Grand Cypress Resort. Take out the stress of long park lines while crushing some balls on the course. 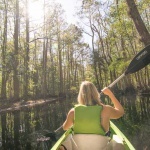 Get your paddles wet in Shingle Creek just outside of Orlando. A short ride away from the theme parks brings you to a whole other world. This peacefully quiet swamp is a great place to take a break from the busy parks. A kayak trip here could bring you all the way to the Everglades if you were up for about two weeks of paddling. ALSO: Earn rewards on your Orlando trip and beyond when you join Orbitz Rewards! A trip to Florida would feel a bit incomplete without setting foot on a beach. 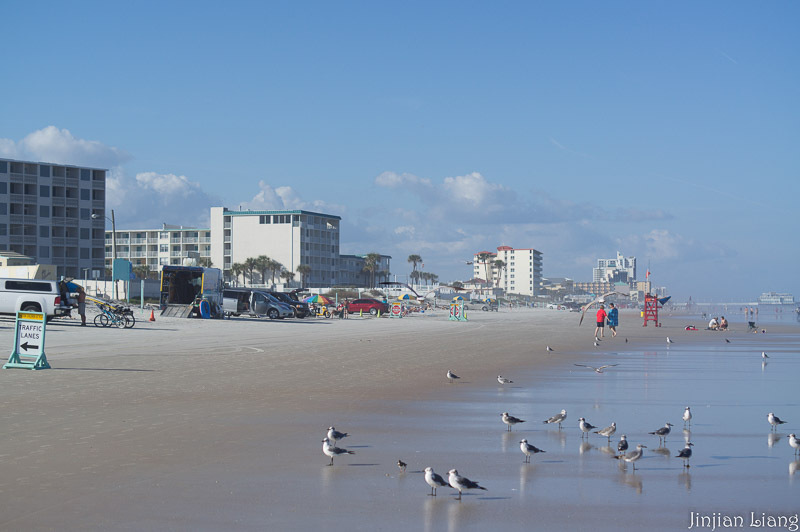 Make the short drive to Daytona Beach and spend the day soaking up the sun and surf. The racing fan in your group will also love a stop at the nearby Daytona International Speedway for a spin around the track. 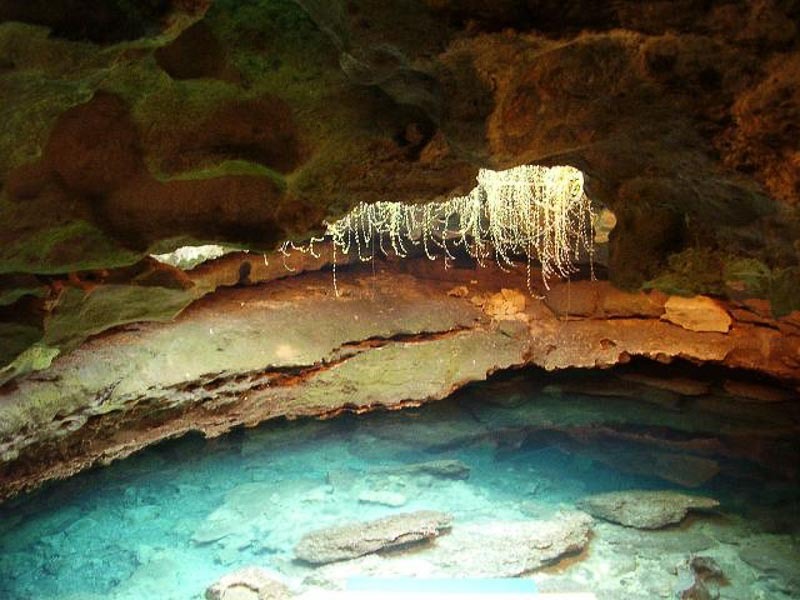 Dive into this prehistoric hole in the ground in Williston for an unforgettable Central Florida day trip. Here you can snorkel or dive in crystal clear water that is 72 degrees year round. The den has ancient rock formations, stalactites, and fossils dating back over 33 million years. Rent a bike and pedal your way through the bizarrely perfect town of Celebration, Florida. You may think you’ve somehow ended up on a movie set it’s so perfect and quiet. Bike paths wind their way through the city and around the small lakes in the community. It’s the perfect places to unwind for a few hours. Take to the skies in a helicopter for unparalleled views with Orlando Heli tours, with locations in both Orlando and Kissimmee. Cruise over wetlands, cityscapes, and the parks of Central Florida. This is sure to be a day trip full of memories and amazing pictures. 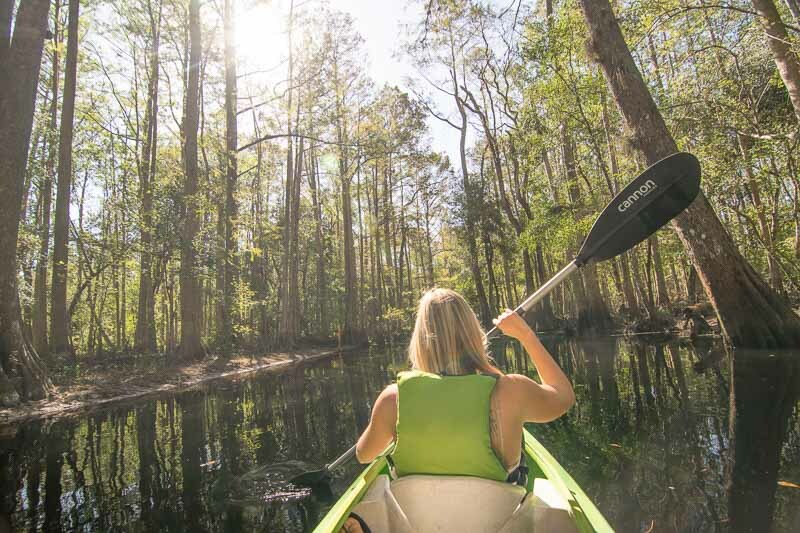 In Kissimmee, you can get back in touch with nature while strapped into a ropes course-inspired adventure center. Take on one of the craziest obstacle courses you’ve ever seen or just coast down one of the many zip lines. Whichever you choose, it will be a breath of fresh air outside of the theme parks. 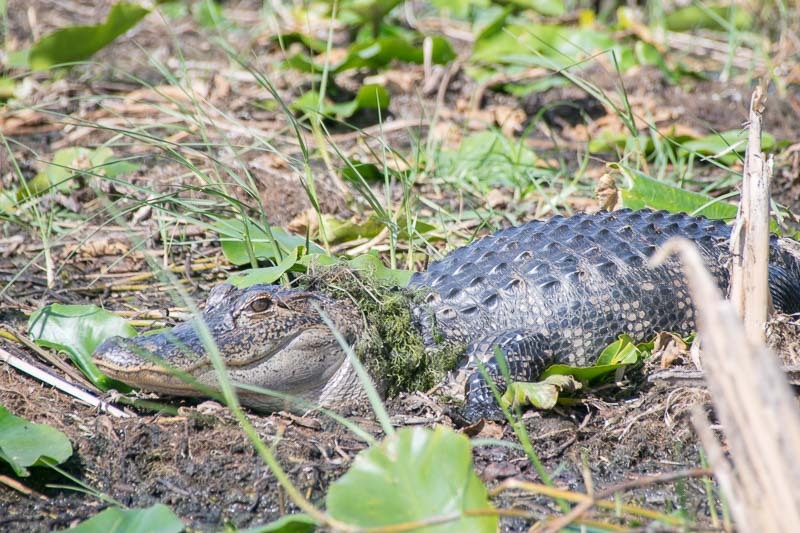 A Central Florida classic, this unique Orlando park lets you get up close to Florida’s most feared and famous reptiles. Here you’ll find live shows along with educational displays about the alligators and their habitat. Forget the roller coasters; their drops are nothing compared to jumping out of a plane from a few thousand feet up. The guides at Skydive City in Zephyrhills will get you ready to make the leap of faith and get you back down safely to their USPA drop-zone. In case you chicken out, you can still make your way to iFly, an indoor skydive experience.